Sweet, hearty, satisfying, ample. How does that sound, for a cookie? 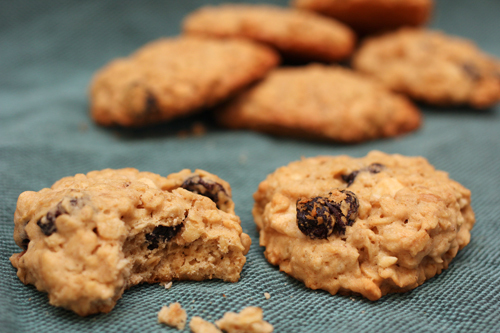 Well, that’s what you get when you make the “Cherry-White Chocolate Oatmeal Cookies,” from Bake or Break. I doubled the recipe, in order to make 32 cookies. So, there’s lots of oats and butter and light brown sugar and eggs. Dried cherries are bigger and better than raisins, I’ll dare to say. And white chocolate is tame and creamy. There’s a time of year (Passover) when we’re overrun with macaroon recipes. 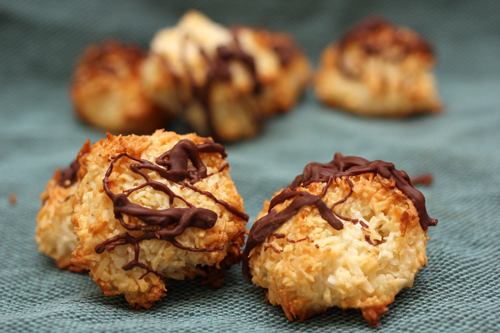 I caved in to that and made the “Coconut Macaroons,” from the April/May 2015 issue of Fine Cooking. Know that the chocolate drizzle was a big plus. I increased this recipe in order to make 30 cookies. Admittedly, this is a cookie of technique, in that they’re all about how you handle the few ingredients. So, when my young child helper enthusiastically formed hard balls to bake, we got a tougher cookie. OK. The recipe asks for sweetened coconut, but my pantry houses unsweetened stuff. No problem. I just added a bit of sugar to my coconut. And oh boy, these cookies are coconutty. You know that, right? Enjoy. Well, that was fun. Next time, I want to cook the “Orange-Sesame Pork with Napa Slaw,” from the March 2015 issue of Cooking Light. Instead of rice, though, I’ll sit this atop some farro. Come back to my site next week, to see how this goes.